This morning Harper and I went to church. I had my final Bible Study of the semester and then we had a Christmas brunch. Harper had a great time in the nursery and didn't take a nap so she was worn out when we got home and skipped lunch and took a great nap. Isn't this little dress cute? Angie Smith made it for her and I just LOVE it! I need her to teach me how to sew. I really, really want to learn. I love pillowcase dresses because she should be able to wear this as a shirt with pants next year. So we can get two years of wear out of it! I didn't get a great picture because of course we were running late and she was not interested in looking at me. This afternoon I made a few more ornaments. Harper actually helped me. I love the way these turned out. The ornaments were not clear glass so you can't really see the brown filling but I think they are still cute. I made one for each of our family. And I think it looks cute on the tree. I think you could make a million different combos to this idea! This morning in Bible study - we read a verse that I wanted to share with you. It just made me think about all of you during this holiday season who are having a hard time - maybe you are lonely - wishing you had a husband to spend the holidays with or a child. Maybe you are sad for the child you lost. Maybe you are worried about finances. Or your health. God gave us His Word to encourage us and to teach us. I hope that you will read the Bible and find hope. I know so many of you ask me what books you can read to help you but honestly the only book I know of that can give you SO much is His word. It can be intimidating and hard to read at times but if you truly try to read and understand and pray for wisdom - I think you will find comfort. God gave it to us as a gift. Isn't it one of the best ones you can open this season? I'm just in awe of your beautiful Christmas trees! Do you hang the ornament ribbon directly to the tree? I love Harper's pillow case dress and tights- she will probably be able to wear it for more than 2 years. My daughter is on her second year of a Halloween one and it still looked like a dress this year. Harper is so cute in her Christmas dress. Angie did a wonderful job sewing that. My sewing machine internally hemorrhages everytime I go near it! ha! Your ornaments are adorable, so much so that I made some for my family. I used Christmas colored shreds and ribbons. Hope they like them. def needed that reminder of the verse. thanks kelly! harper is too cute... i love the pillow case dresses. i have 2 boys so we'll never get to wear them, but it'd make a great idea for my 2 nieces!! and the ornaments are so cute... i might just have to make some soon! Hi Kelly thank you so much for being an encouragement even half way around the world. Your daughter reminds me of my eldest now 9, who napped only once a day at the same age. She was and still is a whirlwind. A big morning set her up for a great afternoon nap and some down time for me! Happy Christmas from hot hot hot Australia! Your daughter is so adorable...could you tell me where you got the leggings that go with the dress or what brand they are? Just a short comment to thank you for posting that scripture Kelly. I really needed to be reminded of that today. The ornaments are great and so does little Harper! I want to invite you to check out Tuesday unwrapped and my GIVEAWAY!! Thanks for posting the verse- I needed it today! That dress is the cutest thing I've ever seen! Love the ornaments. So fun!! Merry Merry!! That dress is too cute! I wish I could sew, too. Maybe one day! I think that verse is a great encouragement no matter where you are in life. Thanks, Kelly! We just made the same sort of ornaments at our MOPS group this morning. I actually wonder if the crafts coordinator reads your blog too! I LOVE Harper's dress and thank you so much for the bible verse. I am sending it in email to everyone I know! Oh how I love that verse...has always been one of my faves! What a great verse and in the season of hope you'd think it would be easy to have hope all the time...but it isn't because Satan does take a day off or a season off, he comes to steal, kill and destroy. So to keep the hope, we have to immerse ourselves in God's word...every single day. Thanks for the encouragement! I totally want to make some of these oraments.. such a fun easy darling idea. I really love the cheetah print ribbon. I am a animal print lover.. AS ALWAYS... Harper is a doll in that oufit.. my goodness, where do you get her clothes? ...and I meant to say that Satan doesn't take a season off. He's constantly prowling around to steal our hope. these are such good ideas this is definatly what I am doing this weekend I was wondering where it is you got t he materials hobby lobby or micheals???? How do others find comfort if not in God's word and through His promises? Thank you. Also, I know you get tired of posting every item Harper wears and where she got it....I have tried to never ask. BUT, I would like to know about those tights. Great verse today....really needed to hear it too. Thanks for the inspiration to read His word. 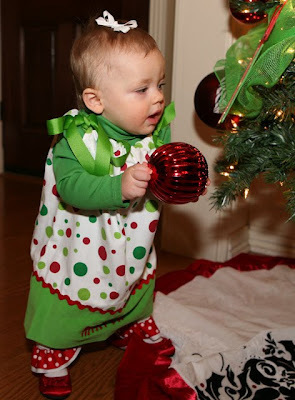 Absolutely love all of Harper's outfits and your great DIY ornaments! Thank you for sharing that scripture. It really spoke to me! Thanks again and God Bless! Where did you get those leggings?!? That little dress is adorable. And who would have thought of a pillowcase dress??????? Genius. Does she make them and sell them? By the way, I have a great giveaway going on right now. C'mon over and check it out. That's a darling dress. We got ornaments like that at our annual Christmas Bunco party on Saturday. They filled them with red paper, wrote BUNCO on them, and then glued 3 tiny dice on them. Sooo cute! Love the dress, love the verse, and love you!!! Harper is dressed so cute again of course! I just wanted to tell you that I borrowed your ornament idea a couple of days ago. My mom wanted to get a little something for each woman in her bible study group, so I made those. I got clear glass ornaments & filled them with the lime green shredded paper. I then tied a red and lime green ribbon on the top of each of them and used a red paint pen to write their initials. We couldn't find any cute stickers in red, so I just wrote them. They turned out super cute. Thanks again! Thank you for sharing that verse...I needed it today!!!! Lowrey was just standing here with me while I looked at your blog and she said "Ahhh, isn't she just the cutest thing???". And then she said "Does your friend Kelly have a husband?" HA! Maybe I need to talk about Scott more! Love the ornaments! I made them too and they turned out so cute! I love her outfit, she is always the best dressed baby around! I love that you take pride in how your daughter looks! A few posts ago you said that Harper wasn't into your Christmas trees, yet. According to the pictures on today's post, it looks like she's found them!!! You may be making a whole lot more ornaments over the next few years! Thank you for that good Word. I've been having a little bit of a hard time this Christmas season. I am blessed with a wonderful husband and three beautiful (and rambunctious) sons, so I feel kinda guilty for feeling down. This is our second year overseas and our second Christmas away from family. Last year things were still new but this year I just miss the fun we have with family and friends. That verse is just a great reminder to look to Him, and He is the reason for the season but also the reason we are here. Thank you! Harper's dress is soo cute! I can't wait until my 3 month old little Mckenna can start wearing some of those pillow case dresses! I just told my mom last week that I want her old sewing machine to mess with... I can do some very very light sewing... maybe I can teach myself! Enjoy your evening! Thank you for sharing this verse. There is someone who barely knows Christ that I have been ministering to and she is really struggling with infertility issues. I look forward to sharing this with her. Wow, I really needed that little bit of encouragement tonight. Hopefully this will give me a little kick in the pants to sit down with the Bible more. Thank you Kelly! I just love the pillowcase dresses! Nothing like having a baby to make you want to sew. I so stole this idea to make teacher gifts this year. My daughter and I loved making them. I added a gift card for Starbucks using ribbon and I am done! Thanks for sharing such a fun craft! And the verse says so much about what I have been going through this year. I love Harper's dress and the new ornaments! I think the frosted glass looks great. Her outfit is darling. I especially love the first pic. I also love the ornaments!!! Cute..cute. That is a sweet outfit and I love the ornaments! Wonderful and encouraging words too! I love the ornaments, I think I am going to make some this weekend! About the bible, I found www.bibleplan.org was a very helpful site, if want to share it with the ones who don't know where to begin! It's super cute and Christmas-y. And the tights? cute! I think those ornaments are so cute! The potential for different color combinations is endless!! My mom is a big Gators fan, so I think I'll be making some orange and blue ones. Have you ever made the swirly marblized ornaments? 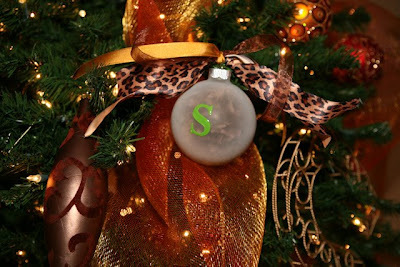 You just take clear ornaments, squirt in a couple colors of acrylic paint, then swirl it around. Then you set them upside down on Dixie cups to let the excess paint drip out and the inside dry. They are always super cute and SO easy! Oh my goodness Kelly! Where did you get Harper's leggings??? My B NEEDS them! And I adore the dress!!! What a verse Kelly, thank you for sharing it with us. I love your ornaments, I am not a crafty girl, but you are really starting to inspire come creative juices in me!!! SO TRUE...thank you for that encouragment! It's easy to forget that everything we need to know is written in His word! Thanks for the verse ~ I'm so glad to visit your blog! 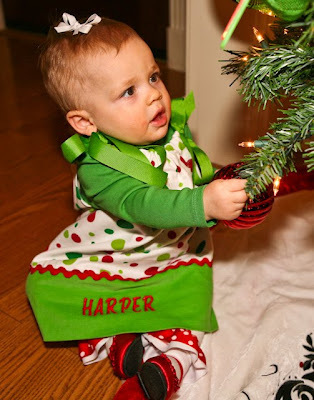 Your Harper is just adorable...she looks like a little Christmas angel. I think your ornaments are a wonderful idea and I'll have to make some. definitely going to need to learn how to make pillowcase dresses! harper is so cute! I have a little boy and there is only so much "cutsie" stuff you can do. haha I love Harper't little outfits and I love the ornaments you made! I may have to steal your ideas! OMG -- love, love, love the leopard print ribbon and ornaments. I can't find that ribbon anywhere here in my town. As always - Harper is just too cute!!! The dress is adorable, and thank you for sharing the verse. ~Wow! I have never seen a cuter Christmas outfit! She's a doll! What a precious little girl in a beautiful dress, made by a very special lady:) What a blessing! Your new decorations are beautiful as well. Thanks for sharing 'hope' with your readers this day. Thanks for sharing such a great verse of scripture. Although my friends are always trying to reassure me that I am only young (20) and have plenty of time to find a husband but I still worry that I will never find that someone. I plan on putting that verse on my bulletin board as a daily reminder. Harper looks beautiful as always in her dress! This is the first comment I've ever left you, though I absolutely love your blog. I wanted to give you a little warning. 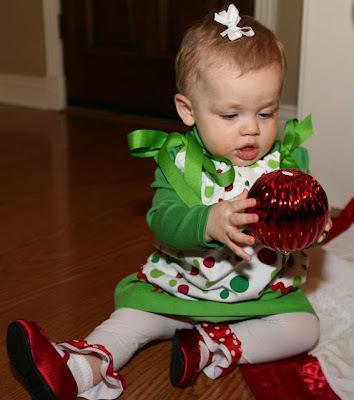 We let our daughter hold the ornaments last year (at one) to take her picture. This year (at two) it was soooo not a good idea. Now, she wants to take them off all the time. Don't make the same mistake I did--do a nice stocking photo or something next year. Thank you Kelly for that encouragement. I'm having a hard time this year...and I do need to just open back up my Bible and let Him speak to me. Thanks. are you doing the Esther bible study? I just started that tonight & that Romans 15:4 is in the first lesson. Such an awesome verse! Your SO right Kelly, the Bible is the best book for ANYTHING especially advice! Thanks for sharing this verse I needed it tonight for sure! Love Harper's dress Angie is amazing at making those for sure! What cuties....the little girl and the dress! Where did you get the tights with the little ruffle? So precious! I love the ornament idea....every year the kids make ornaments for the family so maybe the older kids can try your idea. Thanks! Amen girlfriend! You are so right that it is God's Word that brings us the greatest hope. loved the verse...it is late 12:40 in fla. i have sore throat so i opened up to see your blog and the verse gave me comfort with what we are going through...bank examiners. Pray for the bank my husband opened...Pray God's will...He is the true CEO of the small community bank in Fl. We buried scripture under his office when it was first built. Pray they will be fair and reasonable. Thanks. It is a tough economic times...but God is bigger than it all! He is Amazing God... by the way your ornaments are precious. they made me smile. and want to craft them!maybe later. merry CHRISTmas! He is our gift everyday with the blessings HE gives us. CHRISTmas is everyday!Take care...visit my blog...i have very few followers..but it is a place to share my faith and just journal my thoughts. do not do pics...don't know how. need a new cover, but don't want to spend the money so i found free ones. yours is beautiful. i would love new blog friends! God will send them! Loving God for He is Amazing! has anyone read Francis Chans book Crazy love...read it! I think kelly you blogged about it. Chris Tomlin was just in Tampa. I watched his Christmas concert on tv..Gospel network! hope to see a new friend on my blog. Yes! His Word is filled with Hope!!! Cute ornaments. You HAVE to get Harper's little hand prints onto these ornaments... you could do the snowmen one with pink/green/brown stocking hats to match her tree! Oh how I needed that today! Thank you for being a woman of God; you are a role model for so many of us. LOVE that verse! So awesome!! What kind of stickers do you use on your ornaments and where do you get them? I have used the same clear ball and but garland and berries inside and then tied a ribbon on hte top for a small gift at a christmas brunch before, cheap,easy, and nice all are my favorite things! Those ornaments are the cutest idea! Thank you for the Bible verse- I'm going to read more this morning over my coffee:) Have a great day! You have NO idea how many times I've been lost in my journey with the Lord, I come here to get my daily scoop on Harper and your life, and I see the most encouraging words. Thank you SO much. The scripture is awesome, thank you for that. I've already shared it with a friend this morning. I was the same way with my little girl so I picked up a sewing machine at a consignment store and taught myself. I'm not great, but pillowcase dresses have become a cinch. And, I love to throw together little purses for her to carry with each dress. You can learn how to sew! Wow, that scripture is one of my favorites and I used it on my blog today,also. Love the pics and your encouragements. Keep up the great work!! Have a blessed day!! Romans has so many great lessons on hope. When I was struggling with infertility earlier in the year, I clung to Romans 5:3-5. Love the ornaments. My boys and I made the pink, lime green with zebra ones this weekend. They had so much fun stuffing the ornaments. Thanks for the scripture. Very meaningful to me and oh so applicable. It is absolutely amazing to me how we can read God's word time and again and not come across a scripture or if we had, we've forgotten it. I thought I had almost every verse on hope down, either in my hope book or highlighted in my Bible. I did not have this one!! It is so clear! SCRIPTURES BRING OUT HOPE! Thank you for sharing this. I agree...if you need direction, read God's word, keep reading it even when the hope is so hard to see. It is in there!! Sorry this was long but I got excited at the scripture. ps The verse is highlighted today!! Thanks for the verse, it has special meaning for me right now! LOVE Harper's tights, SO CUTE! Did someone make those too? Thanks for the bible verse. Your faith is inspiring and I love that you share it with us! Harper's dress is adorable. Where did you get her tights? I love that verse you posted...I've read the book of Romans through many times, but can't remember really 'seeing' that one, it is a really good one to meditate on! I agree, Kelly...Christian books are great to read, on topics like spending more time with God, being a more godly woman, etc...but just to flat out sit down and read a passage in the Bible like Titus 2:3-5, for example (what I read this morning on my desk calendar) and dwell on it is where you see that the word comes alive and is actual nourishment for us! God Bless your family at Christmas! Thank you, Kelly, for the beautiful scripture. It was definitely something I needed to hear during this season of my life. And thank you so much for reminding that the most encouraging book we can ever read is the Bible. Sometimes we all go through the Christian Bookstore looking for inspiration...which is great...but, God really gives us all we need in one perfect book. How blessed we are for the written word! I enjoy your blog so much! Thank you for opening up your life to the world! I LOVE your ornaments! They came out great! I showed my mom & she is thinking of making some for her tree! I have been a fan of your blog for some time & I love all your ideas you share, Thank You! She makes me look like a great seamstress!!!! So stinking adorable, kelly...and i will teach you to sew as soon as you move your family (including your mom and dad) to nashville. come on!!!! Kelly- Will you please please please pray for my sweet baby Parker. I delievered yesterday and he was 6 weeks early and was in the NICU. I know you went through this with Harper and I am so overwhelmed right now. I can't find your email on here. Mine is annamballard@yahoo.com. But if you could please add him to your prayer requests! Thank you! Love the ornaments with the leopard ribbon! So cute! Those would be great easy Christmas gifts! You're missing two important initials on your ornaments ... M and D !! You'll notice it more once Harper starts talking, but your name isn't Kelly anymore, it's Mommy. The first time my daughter asked me to spell my name and I started out J-e she was like, No silly Mommy! It starts with M! The other day I decided I wanted a stocking with my name on it. I asked my husband and daughter if I should have it embroidered with Mommy, Jennie or Mama Jennie. Amelia IMMEDIATELY said Mommy. It took a couple of years, but I now find myself looking at M things for initials (like pillows!) without realizing it. You may find yourself in the same boat, too, or maybe not. Everyone is different. Just thought I'd point it out in case you wanted to add M and D to your pretty Christmas ornament collection!